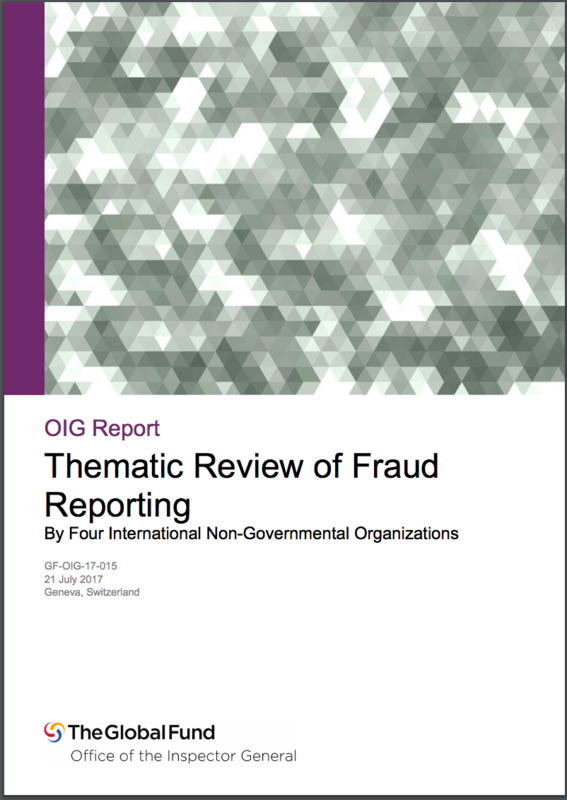 A thematic review of fraud reporting by four international NGOs (INGOs), conducted by the Office of the Inspector General (OIG), has concluded that all four had strong anti-fraud policies and procedures in place. The OIG said that there were only a few examples of under-reporting, which have since been rectified through the implementation of improved procedures. A report on the thematic review (GF-OIG-17-015) was released on 21 July 2017. The four INGOs are Catholic Relief Services, Population Services International, Save the Children and World Vision International. The four are responsible for implementing more than 30 active Global Fund grants totaling over $1.2 billion in countries categorized as extreme or high risk by the Global Fund. Catholic Relief Services (CRS) was founded in 1943 to serve World War II survivors in Europe. It has since expanded with a global reach of more than 107 million people in 101 countries on five continents. Headquartered in Baltimore, Maryland, U.S., CRS had, as of 2014, over 5,000 employees and revenues of $733 million. Population Services International (PSI) was founded in 1970 as a global non-profit health organization headquartered in Washington, D.C., U.S., with programs targeting malaria, child survival, HIV and reproductive health. PSI operates across 60 countries and employs over 8,900 staff. Its revenues in 2015 were just over $652 million. Save the Children Federation, Inc. was founded in 1932 and is headquartered in Fairfield, Connecticut, U.S. Save the Children International was founded in 1977 and is a worldwide non-profit organization comprising 30 member organizations. Headquartered in London, U.K., it has over 14,000 employees. Its combined revenues in 2015 of over $2.1 billion were used to reach around 62 million children in over 120 countries. Save the Children Federation, Inc. is the principal recipient (PR) for a number of Global Fund grants; however, the grants are implemented by Save the Children International, which acts as a sub-recipient under the grant agreements. World Vision International (WVI) is a global Christian relief, development and advocacy organization dedicated to working with children, families and communities to overcome poverty and injustice. Its predecessor was originally founded in the U.S. in 1950. WVI now comprises offices in 90 countries with headquarters in London, U.K., Monrovia, California, U.S. and other locations. The combined revenues for the World Vision global partnership in 2016 amounted to around $2.7 billion and it has approximately 41,000 staff. Under the Global Fund’s Grant Regulations, all PRs are required to “notify the Global Fund promptly in writing of any audit, investigation, probe, claim or proceeding pertaining to the operations of the principal recipient or any of its sub-recipients or suppliers.” The Fund’s Code of Conduct for Recipients imposes a similar obligation. All four INGOs have whistle-blowing or counter fraud policies which require their employees to report suspected fraud, the OIG reported. However, the OIG noted, while fraud reporting mechanisms were in place in all four INGOs, not all such mechanisms currently provide for online anonymous reporting. In addition, some gaps and inconsistencies in the implementation of fraud reporting policies and procedures were found at country level. For INGOs and other implementers with fraud reporting policies and procedures and professional investigation resources, record all allegations and suspicions of fraud received, both at country and HQ level. The subsequent assessment and the rationale for taking the decision to investigate or not investigate must always be fully recorded. For implementers without such fraud reporting policies and procedures and professional investigation resources, all reports must be relayed directly to the Global Fund. Clarify in whistle-blowing policies that any acts of retaliation against whistle-blowers will be taken seriously and could potentially lead to disciplinary action. Communicate clearly to sub-recipients their contractual obligations concerning fraud reporting and the response to fraud to ensure that they meet their obligations under the grant agreement and the Code of Conduct for Implementers. Be clear in guidance and procedures to country offices on how to report and respond to fraud reports. Implement anonymous reporting mechanisms at a country level, including training and awareness of the complementary whistle-blower anti-retaliation policies. Notify the OIG prior to starting investigative fieldwork so that it can provide input to terms of reference and consider undertaking a joint investigation, where warranted. Provide the Global Fund and the OIG with copies of internal investigation reports relating to Global Fund resources as well as any recommended remedial actions to mitigate the risk of similar future occurrences of fraud. To assist implementers to understand, identify, manage and respond to wrongdoing, and as part of its “I Speak Out Now!” initiatives, the OIG has created an Anti-Fraud and Anti-Corruption Tool Kit for Implementers.